Orlando is a great way to spend the New Year’s with your family. Disney World is a great choice to ring in the New Year. The Magic Kingdom, Epcot Center and Hollywood Studios are open late (Animal Kingdom closes at 8 p.m.). But the party is at Pleasure Island! The streets are filled with music, food and entertainment. There is also a fireworks display at midnight to bring in the New Year. Even though LA is a hotspot year round, the city bursts with energy on December 31st. There are tons of clubs and restaurants to choose from with a spectacular fireworks display at midnight. There is also the Pasadena Tournament of Roses Parade on January 1st. The parade has floats made out of roses, marching bands and a celebrity Grand Marshal that leads the parade. After the parade, the College Football Rose Bowl starts. Millions of spectators enjoying watching their favorite college teams battle it out on New Year’s Day. The party doesn’t start until midnight in New Orleans! The biggest celebration is at Jackson Square where packed partygoers ring in the new year with Baby Bacchus falling from his perch atop the Jax Brewery. After that, a huge fireworks display is shown over the Mississippi River. 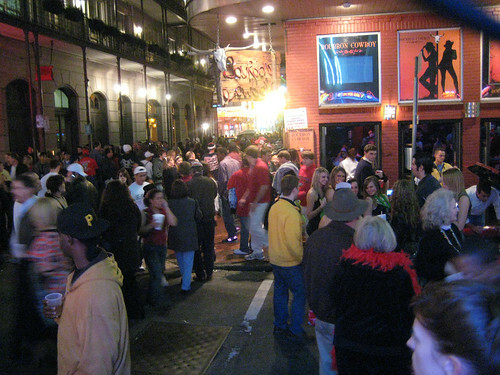 Once the fireworks are over, the partygoers migrate down to Bourbon Street where the party continues until morning. Sin City knows how to through a party and New Year’s is no exception! The Las Vegas Strip is closed down to traffic and transformed into a huge street party. With tons of food, drinks and entertainment there are plenty of activities to keep you busy until midnight. Plus, there is a huge fireworks display at midnight to ring in the New Year. If you want to rub elbows with A-list Celebrities like Diddy and Kim Kardashian, expect to pay $150 to $250 to get into the upscale Las Vegas nightclubs. The most famous New Year’s Eve celebration in the world is at Time Square in New York City. This event should be on your “must do once in your life” list! Not only is the ball drop seen by millions, but the vibe in the city is reason enough to go to New York for New Year’s Eve. If you are planning on going to Time Square for the annual ball drop, make sure to get there super early if you want to see all of the entertainment festivities happening.